A very tired Santa Claus enjoying some cookies, post Christmas Day. If you came to my blog looking for photos of our Christmas celebration, I'm sorry to tell you that story will have to come later. I came down with the flu over Christmas week and was ill with chills, fever, body aches and congestion. Did I mention body ache? Yes, major body aches! My best description of those body aches is one I heard used on the local news reporting that many other people are coming down with the flu. They said that they feel as if they have been hit by a bus! I have not felt as sick in a long time! I get a flu vaccine every year. In fact, I have been getting a flu vaccine every year for the last 20 years. Up until this year it has always protected me, but this year I heard that the vaccine is not as effective as usual. 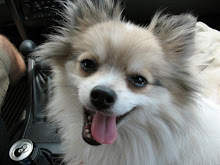 However, my doctor told me that because I did get the vaccine my flu symptoms were going to be less severe than others who did not, and I have to admit I began to feel better much sooner than I expected. So, although Santa Claus left many wonderful presents under our tree, for our children and grandchildren, we have to wait until the weekend to have everyone over to open them. 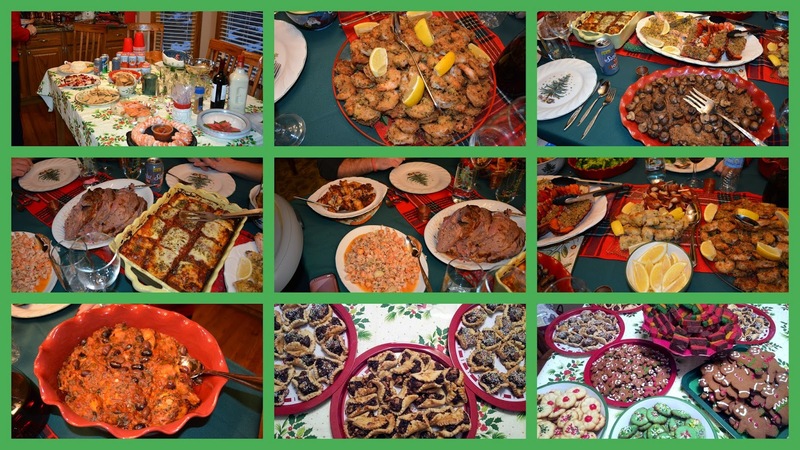 We will have our delayed Christmas Eve Italian "Feast of the Seven Fishes" tradition then, and enjoy all the festivities we missed a little later than planned. Instead of spending time with my family I spent Christmas Day watching the snow fall. The snow fell softly all through the night and my neighborhood looked as pretty as a Christmas card when we awoke in the morning. Being sick is never fun, and being sick on Christmas was a totally sad occurrence for me, but I do believe that one can keep the spirit of Christmas alive in one's heart all through the year and a late celebration will be just as good as one on the holiday itself. I hope your Christmas celebration was a good one, dear reader, and that you stay well and avoid this terrible flu! 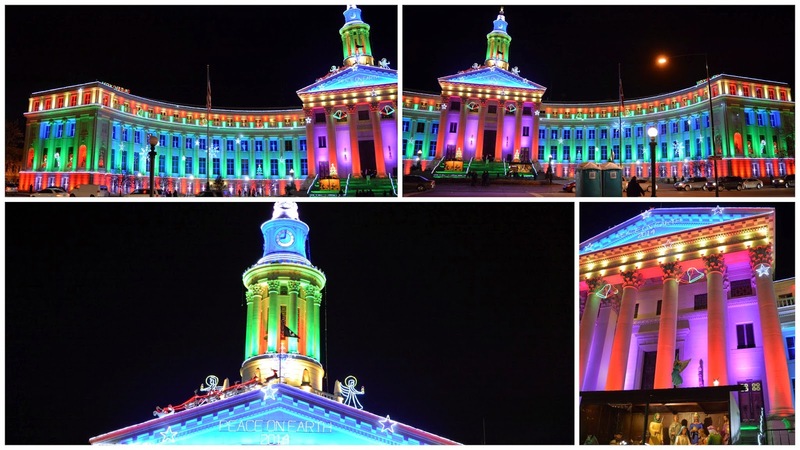 Christmas Lights in Denver--Merry Christmas to All! 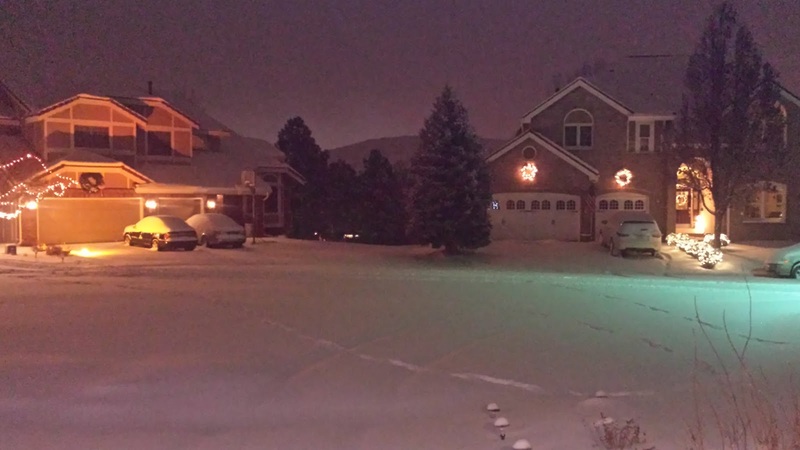 Denver, Colorado has the Christmas spirit! Every year major buildings in the city are lit during the Grand Illumination ceremony, following a long history of Christmas lights in the city. It is always inspirational to see the Nativity scene on the steps of the City and Country Building. 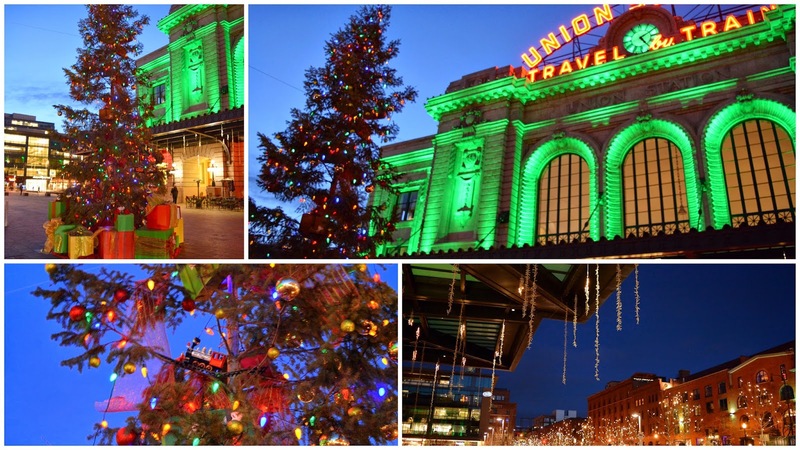 This year Denver's newly renovated Union Station was also beautifully lit with LED lights! Do you see the train in the branches of the 35 foot tall Douglas Fir Christmas tree outside? There is a magnificent Christmas tree inside the station, decorated with beautiful ornaments in a vintage theme. We visited the station a few times this year to shop and dine at the restaurants inside. It is a wonderful place to meet friends and relax at the station's numerous chairs, tables and benches, while in Denver. 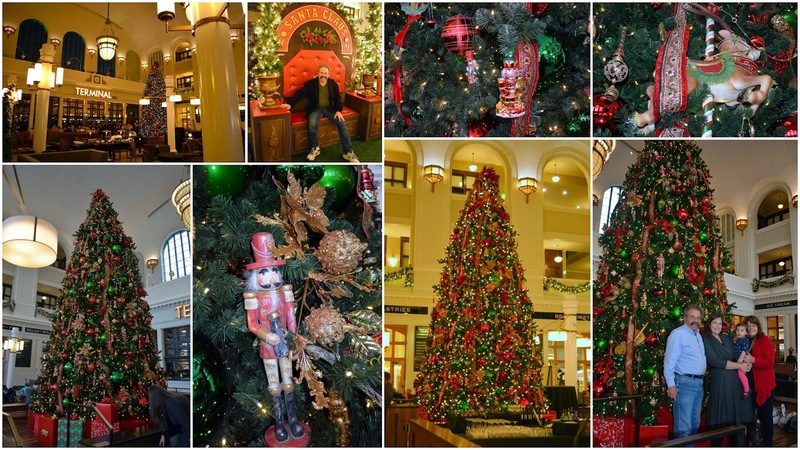 Many of Denver's buildings and hotels are beautifully decorated for the Christmas season and my husband and I enjoyed strolling around the city to see them. Our weather has been very mild so far this year, so it has been pleasant to enjoy the city when we have the opportunity. There is free ice skating at Southwest Rink at Skyline Park , if you have your own ice skates, otherwise there is a low fee to rent skates. The 16 Street Denver Mall is well lit and full of stores to shop in for holiday gifts, with free bus service going back and forth along the streets. 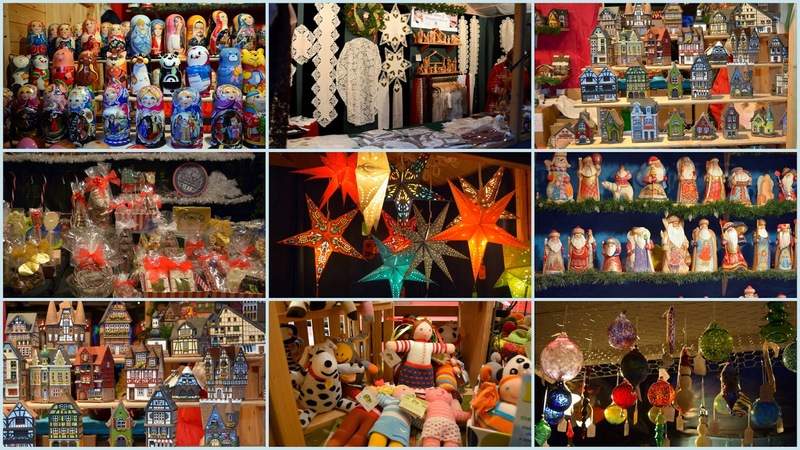 The annual Chrsitkindl German Market is very popular with residents and visitors to the city, click here to read my post about the market this year. It always looks like Christmas on Larimer Square, with the lights strung cross this premiere Denver location for upscale boutiques and fine dining. The very best part of the 2014 Christmas season has been spending time with our grandchildren! 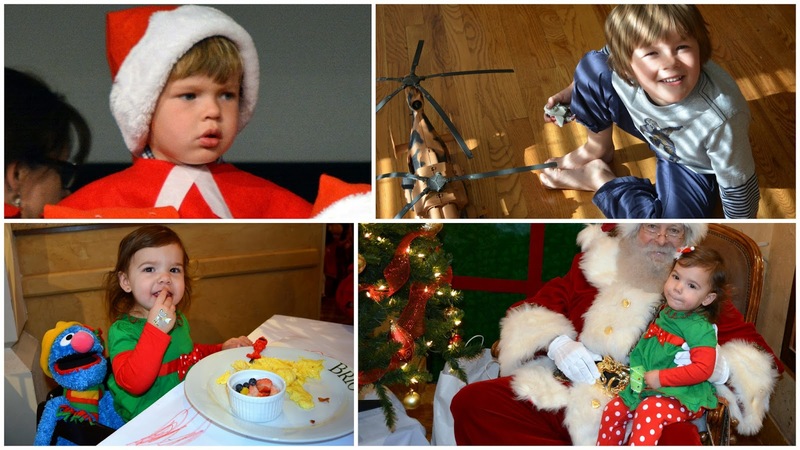 Our littlest grandson was in a pre-school Christmas pageant, our oldest grandson had a birthday, and our granddaughter went to a Santa Claus breakfast with us! They keep us busy and happy and we are looking forward to sharing Christmas Eve and Day with them! There were many other things I wanted to share about the Christmas holiday here in Denver, but it will have to wait until after the big day! Come back to my blog soon to see the Colorado Governor's Mansion decorated for Christmas and some special recipes I made for the holidays. Wishing you all a very Merry and Blessed Christmas! 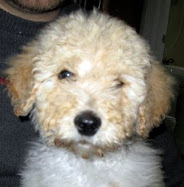 Thanks to all the blog hosts! ....and inside! This is our eight foot Noble Fir Christmas tree. It was so heavy we decided to place it by our staircase this year, instead of in front of our living room windows. I like how it looks here, and it is easy to walk around and see all our ornaments. I'll also have room to place all our family's presents underneath, on Christmas Eve! The first rule I taught my 22-month-old granddaughter about the tree was: "Look, but do not touch!" Smile. She has been very good, so far! Another view of the tree during the daytime, and from a different angle. We placed the cotton fluff on our staircase railing to protect it from being scratched by the lighted garland we hung there. 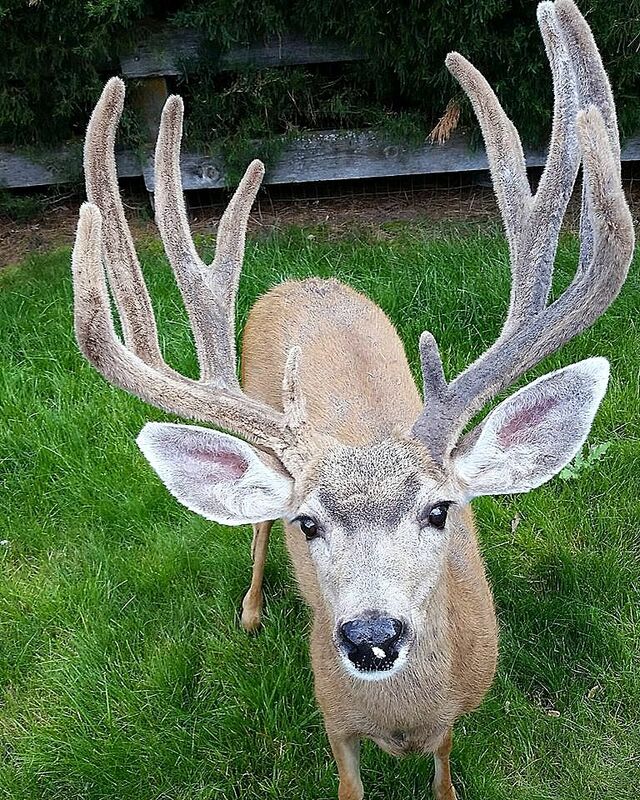 When my granddaughter first saw it she said: "Look! Clouds!" 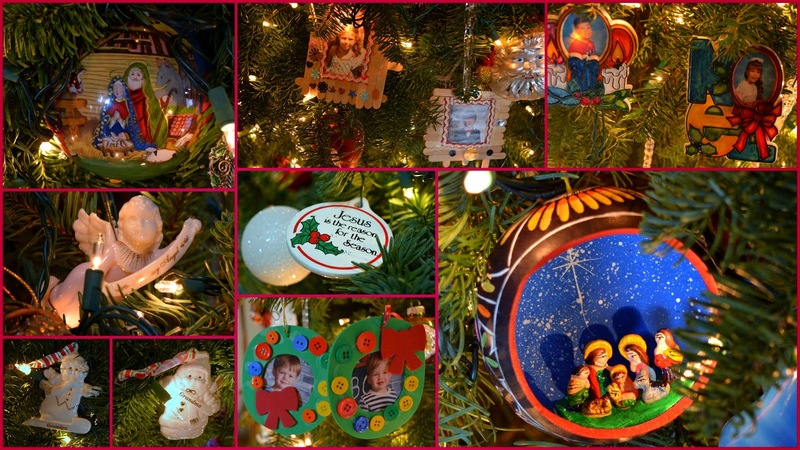 I love to decorate my tree every year, as almost every ornament on it holds a special meaning for me. Some have been handmade by my children when they were young, and some by my grandsons. I'm sure my granddaughter will add her own creativity to our tree one year in the future. 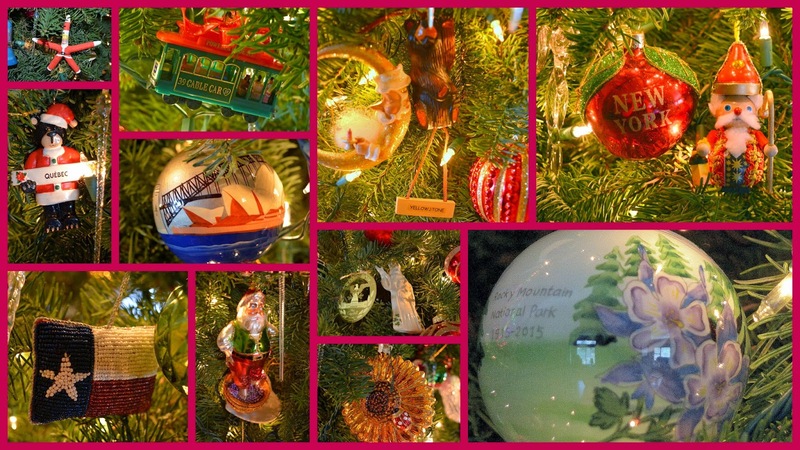 Many ornaments were purchased on our vacations. I'm showing just a few. They are a Santa starfish from the Outer Banks in North Carolina, a cable car from San Francisco, a Brown bear from Yellowstone National Park, another bear from Quebec, Canada, the opera house in Sydney, Australia, a Big Apple from New York, City, a Saint Nicholas from the German Christkindl Market in Denver, a beaded Texas flag from San Antonio, Texas, Santa crushing the grapes from Napa Valley, California, an America Eagle from Washington DC, a Belleek Saint Patrick from Dublin, Ireland, a wild sunflower that we saw all over Wyoming, and this year's 100th anniversary Columbine flower ornament of Colorado's Rocky Mountain National Park! as well as ornaments that friends and family have given to me over the years. There are really too many to show in one blog post, but each and every one of them is so special to me! I have a small artificial tree on my kitchen island, as well as my two ornament baker "helpers" that stand underneath. 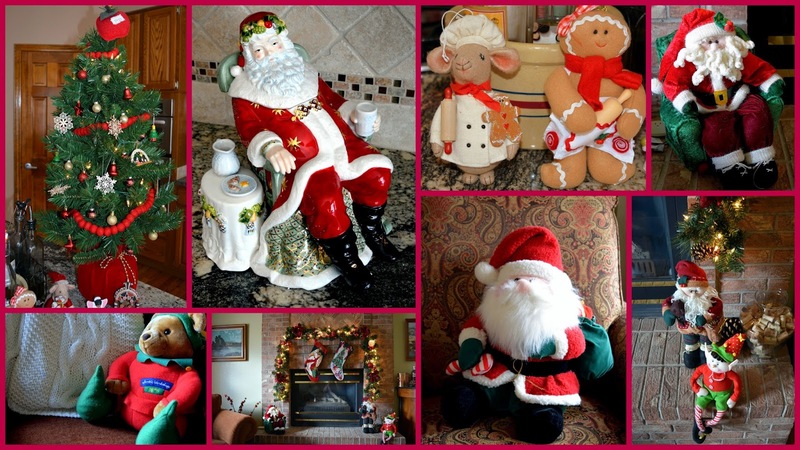 The beautiful Waterford Santa Claus cookie jar was a gift from my husband many years ago. The stuffies around my fireplace are there for my grandchildren to enjoy. Our Nativity set was purchased the first year we were married, forty years ago! It also holds many memories for me. The angels turn as "Silent Night" plays from the music box underneath. Of course, in an Italian home food is also an important part of the Christmas holiday, and I adopted many of my husband's Calabrian food traditions, as well as my American holiday food traditions, into my menu. Last year's feast is shown above. From appetizers to homemade Christmas cookies for dessert, we enjoy a holiday "abbondanza," which means an abundance in Italian. We are so thankful for all our blessings and our ability to make Christmas a holy and happy holiday for our family! 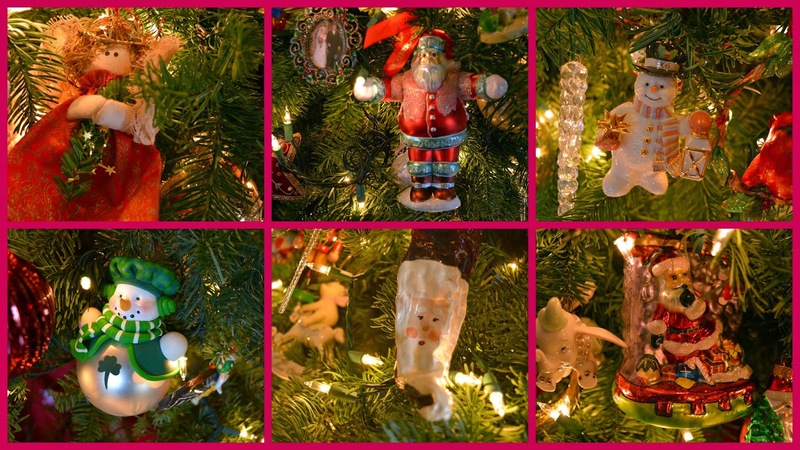 Thank you for sharing a glimpse into our holiday--I look forward to seeing your traditions! My husband and I were invited to a casual "Joyeux Noel" party that friends were having at their home the first weekend of the Christmas season. The hosts have a cookbook that they enjoy using entitled in English, "I Know How To Cook," or "Je Sais Cuisiner," in French, by author Genette Mathiot. They used a favorite recipes from this cookbook as their inspiration for their party menu. This cookbook has sold over six million copies in France, since it was published in 1932, and is one of the most popular cookbooks in French households. In Italy, "Il Cucchiaio d' Argento" or in English, "The Silver Spoon" cookbook is that nation's most popular cookbook. What both cookbooks have in common, is that the thousand plus recipes that are within, are basic home cooking and written in simple succinct terms without illustrations. There are very few "step by step instructions" in both cookbooks, as cooking techniques are understood, and not described. They are probably not cookbooks for a true novice, but the recipes work and are delicious! I'm not sure we have a cookbook equivalent in the US of these two cookbooks? What would you nominate for the honor of a cookbook every American household probably has on their shelves? In my early marriage, I relied on "Better Homes and Gardens" cookbook, but perhaps the bride of today likes Mark Bittman's "How to Cook Everything" cookbook? I have many favorite cookbooks, in fact, I blogged about some of them quite a while ago in 2008, that helped me to learn how to cook southern Italian food that my husband grew up eating. Unfortunately, the blog that inspired me to write the post no longer exists, but many many more food blogs exist today that are a wealth of inspiration and most likely the recipes most of us turn to when we are searching online about how to make something pleasing. I have so many favorite food blogs that I would not know where to begin to list them, but one of my favorite websites to turn to is the Williams Sonoma Recipes web site, as I have never been disappointed by one of their recipes! I wanted to bring a French style dessert to our friends' party and a tart came to mind. A quick search leads me to a selection of wonderful looking apple tarts, and the one I chose to make was the Classic Apple Tart with Frangipane. I knew there would be quite a few people at the Joyeux Noel party, so instead of using a regular size 9-inch tart pan I used a larger 12-inch pan and increased the recipe ingredients by one third. If you are looking for a light and delicious apple tart for a holiday dessert I think you'll be pleased with this recipe, or a similar Williams Sonoma Apple Frangipane Tart recipe using a purchased puff pastry crust in a rectangular shaped tart pan. I may make that next time! We had a wonderful time at the party and enjoyed the French theme! The hosts might do a German-themed Christmas party next year, on the suggestion of another friend, and perhaps the year after I can collaborate with them to have an Italian themed Christmas party? There is no doubt that no matter what the party theme will be it is fun to celebrate the holidays with friends! My Christmas tree is decorated (come back to see it in my next post! 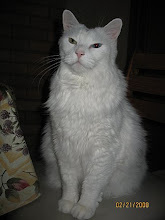 ), my Christmas shopping is completed, and my Christmas cards are mailed. Now to begin baking some of my favorite Christmas cookies for the holidays! I look forward to searching your blog for a few new cookies to try! * In full disclosure I was NOT compensated in any way for this post by any of the cookbooks mentioned or web links. provided. 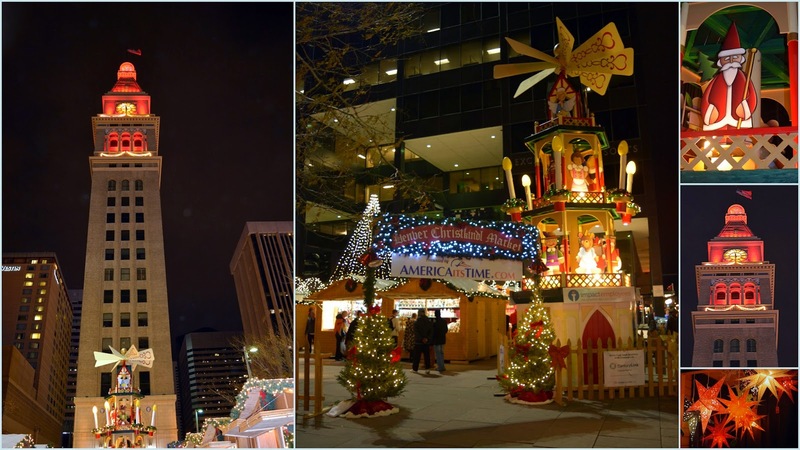 The free 14th annual Christkindl Market is located at Skyline Park at 16th Street Mall and Arapahoe Street and is open from November 21 to December 23, 2014. German Christmas markets date back to the 14th century, and were a popular way for German towns people to buy holiday food and supplies, as well as to celebrate the Christmas spirit. These traditions spread to Austria and other nearby countries. 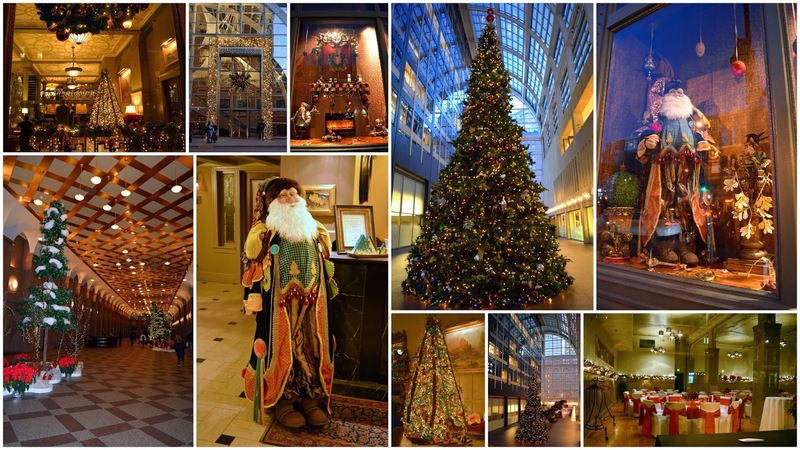 To read more about Christmas in Germany, click on this link. Although Denver's Christkindl Market is smaller than ones in Germany, it also provides a lively Christmas aura and gives one an opportunity to purchase authentic handmade ornaments from Germany and other European sources. .....as well as many other booths that offered linens, lace, traditional lighted paper stars, wooden clocks, chocolates, wooden village houses, hand knitted dolls, mouth blown glass ornaments, and many other items I have not shown. There is also a large heated tent where market goers can sit and enjoy free entertainment as well as to buy a cup of traditional German "Gluehwein," which is a warm, spiced red wine. Click on this link for the recipe. A variety of German beers are also sold in the tent. We attended the market early this year to see the opening ceremonies. There we saw the traditional "Christkind" or "Christ Child" welcome everyone to the festivities by reading a translated version of the German Christkind welcome manuscript. This year's Christkind was Ms. Shersten Eschhotz, who was dressed in the traditional white and golden robes. Members of the Colorado Symphony Orchestra also performed during the opening ceremony. 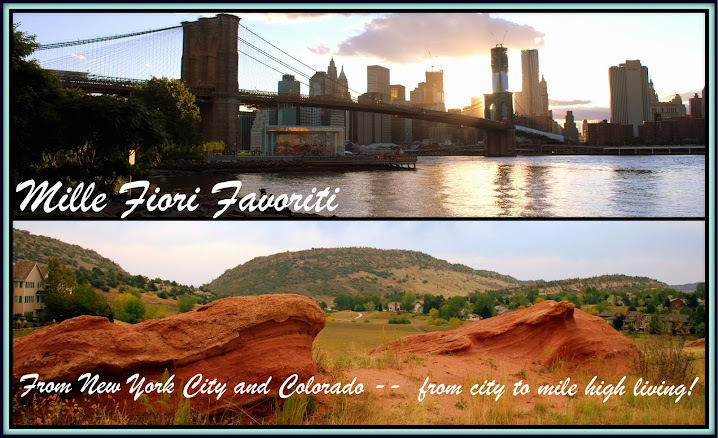 Click here to watch a short video on my Mille Fiori Favoriti facebook page. 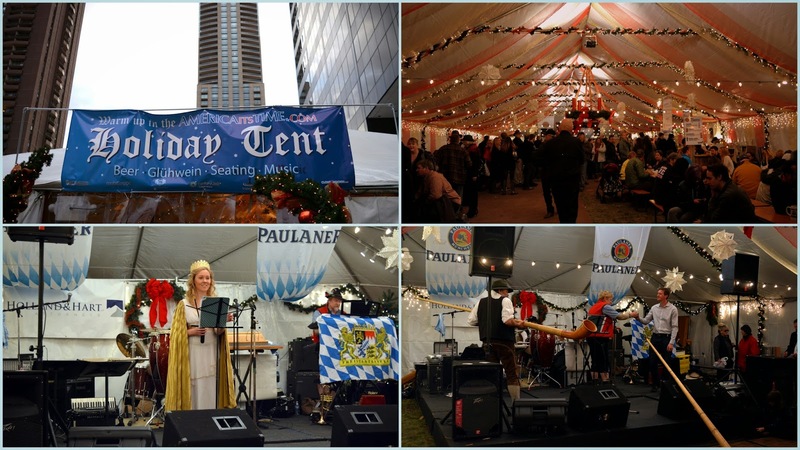 There are many opportunities to see free entertainment in the holiday tent, from German as well as worldwide traditional song and dance and instrumental music. Click here for a schedule of entertainment events. Saint Nicholas is in attendance one weekend of the market, dressed in his traditional bishop's robes. Some believe Saint Nicholas is the origin of today's Santa Claus. What do you think? To read about the German traditions of Saint Nicholas click here. 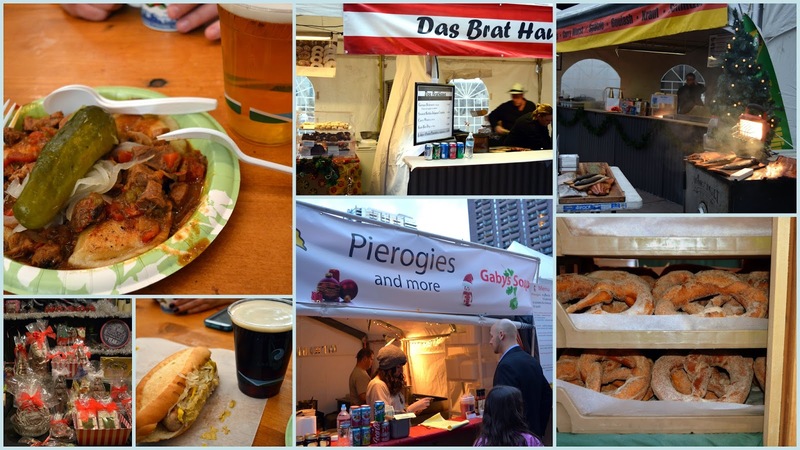 There are also opportunities to buy different ethnic foods in the Christkindl Market. We enjoyed goulash and pierogies, and brats with sauerkraut. So good! We were tempted by the large soft pretzels that came with different toppings, but ended up treating ourselves with a large apple strudel that we took home to have for breakfast the next day. The Christkindl Market is especially beautiful at night, all lit up with lights and the booths warmly illuminated from inside. Local high school glee clubs often appear at the market to sing Christmas Carols, which adds to the festive atmosphere. 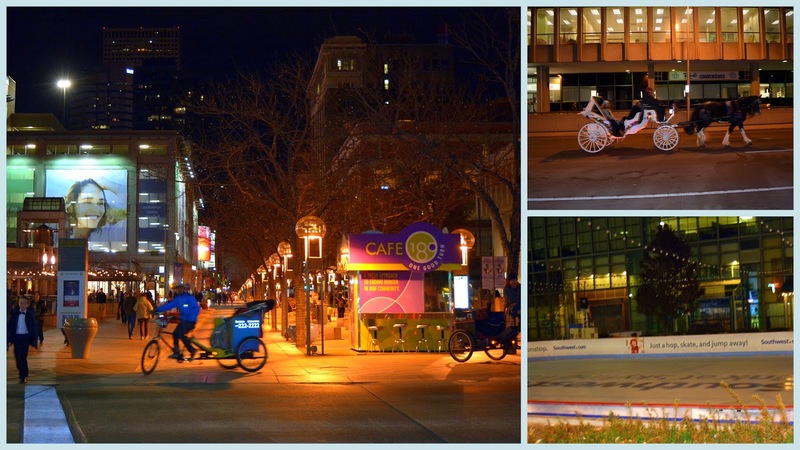 .......and the adjacent 16th Street Mall is alive with activity, as well as the Southwest Skating Rink, that is now in full swing. Skating is free, if you bring your own skates, otherwise skate rental is only $2. 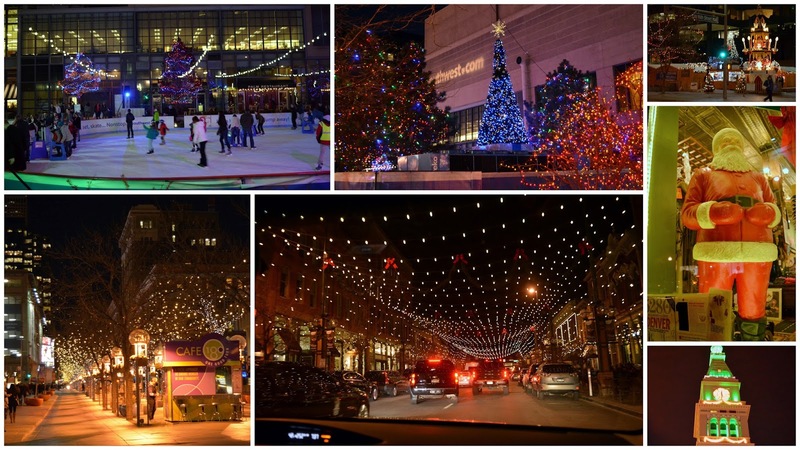 Denver has much to offer during the Christmas season, and this is just a small sample of how this city shows its spirit! I'll be showing much more in future posts. Happy second Sunday in Advent! Are you finished with your Christmas preparations? This season seems to pass so quickly, doesn't it? It is a good time to continue to reflect on all our blessings and to share happy times with those we love. 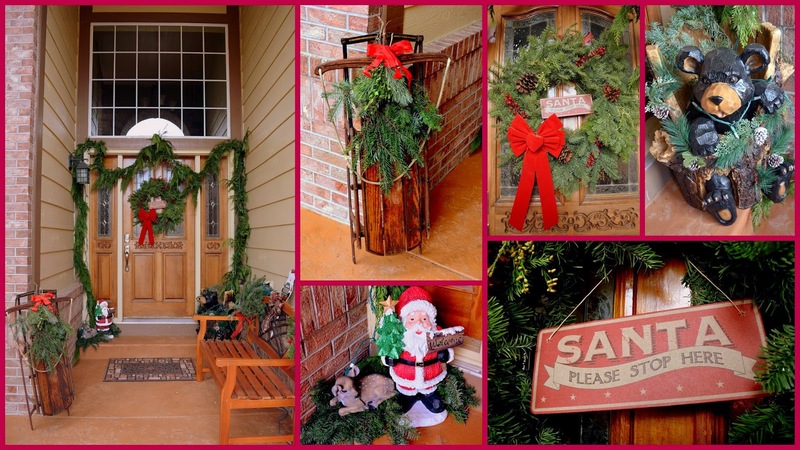 I finished all my shopping , and we decorated the outside of our house and some of the inside. We have an 8 foot Noble Fir Christmas tree this year, which we placed in a new spot in our house, as it was too wide for where we placed our tree last year. When it is all decorated I'll show some photos here on my blog. I fill it with many ornaments that mean a lot to me. Every year those ornaments bring back special memories. I love Christmas, don't you? Thankful for Our Many Blessings! I made lots of food for our Thanksgiving feast, which I served buffet style, as I find it is easier to have everyone make their own dish from all the selections. 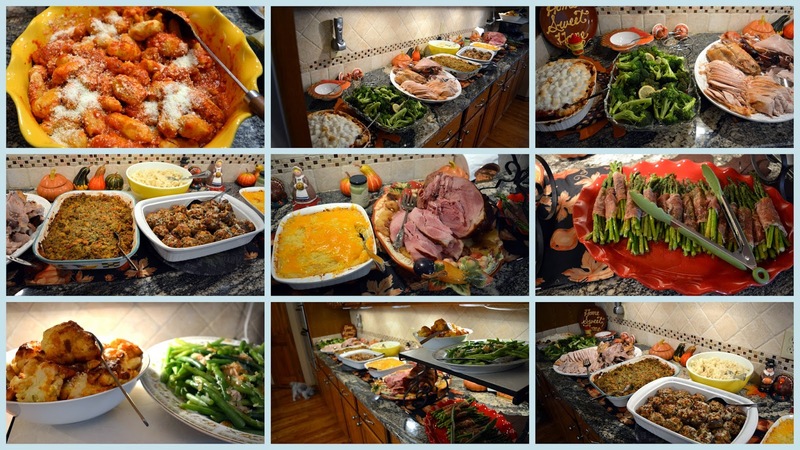 We had butternut squash gnocchi, a roasted turkey plus a baked ham, gluten-free stuffing, and many vegetable sides. Everyone takes home leftovers or comes over for a second meal the next day, so it all gets eaten! We also had pies and an ice cream birthday cake for my daughter for dessert. I had hoped to get some nice group photos of my grandchildren, to use for my Christmas cards this year, but as you can see they had other ideas. My granddaughter does not want to sit still too long to pose for photos and my littlest grandson was also camera shy, as he just woke up from a nap. 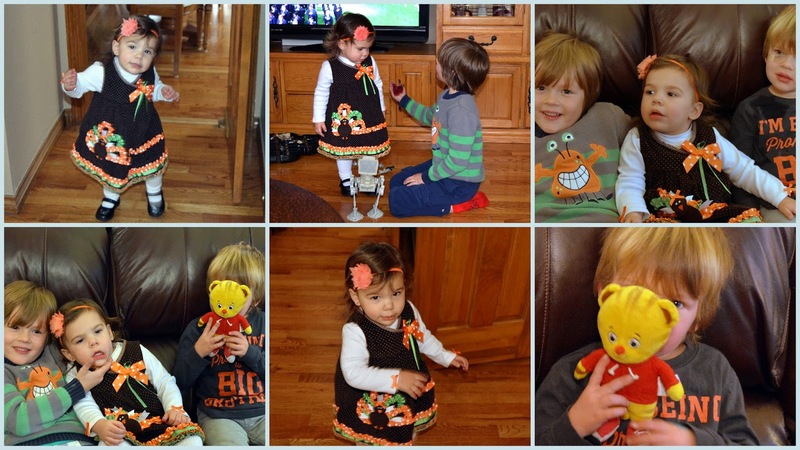 They had a good time playing together all day and fill our lives with joy! Happy News!!! The words on my little grandson's shirt say "I'm being promoted to a BIG brother"! We can now share the happy news that my daughter-in-law is expecting another baby in late Spring! We are all so very happy to see our family growing, and to be here in Colorado to share in many of their happy life events! We are certainly thankful each and every day for all the blessings in our lives. 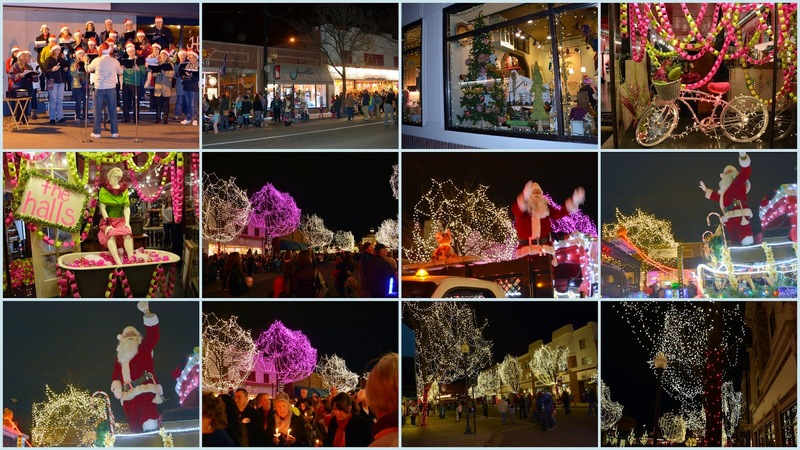 The day after Thanksgiving the town of Littleton, Colorado has a celebration called The Candlelight Walk. Santa Claus and his sleigh start a candlelight procession down Main Street and magically illuminate more than one million lights in the trees as he passes each block. When he reaches the end of Main Street, Santa draws the name of one child to help him throw the switch to illuminate the Christmas Tree in the plaza, and afterward, he makes his way to the Town Hall Arts Center for photos and to hear the first wishes of the children for the season. The event is free, and nonperishable food donations are accepted for the Inter-Faith Community Services, as well as toy donations for the Arapahoe Santa Claus Shop. The merchants along Main Street stay open late for holiday shoppers, and as you can see by my photos, I enjoyed seeing many of their wonderfully decorated windows! Our little granddaughter also had a chance to visit Santa Claus at a local mall this past weekend, and as you can see, she was very excited to do so! 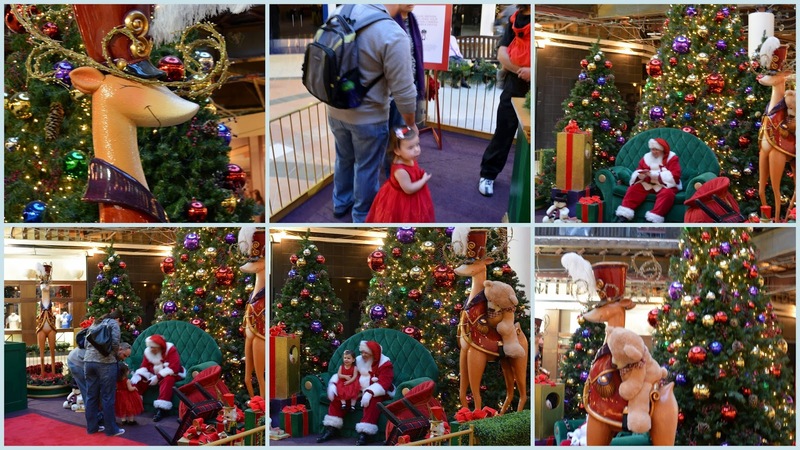 I know she also liked seeing the big teddy bear and reindeer just as much as seeing Santa. To a young child, it is all so magical! 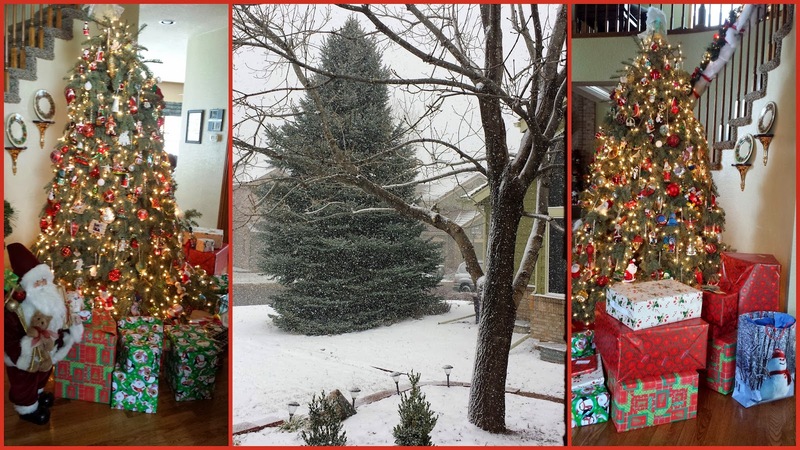 Denver, Colorado, and its surrounding neighborhoods have many wonderful Christmas traditions, and I hope to be able to share many with you on my blog this year. I am also looking forward to seeing how you enjoy this most wonderful time of the year!